When I decided I wanted to do a Valentine's Day edition of Retro Fridays this time, I knew I wanted it to be something old and sappy and sweet and a favorite. And it didn't take long at all before my mind alighted on a title I am almost sure you have never heard of--Romance is a Wonderful Thing by Ellen Emerson White. Now, I regularly fly my White fangirl flag as you know, but I don't know if I've ever talked about this early, lesser known book. 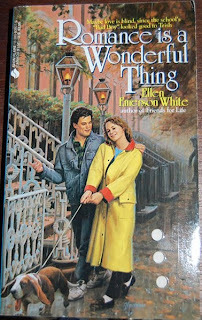 I'd been a devoted White reader for years before I ever heard of it and then it was only thanks to my friend Nan (a devoted EEW fangirl herself) who clued me in to its existence. So I ordered a copy off Half.com because, naturally, it was out of print. And when it arrived in the mail I devoured this trim little 188-page treat that night. First though, before we even get to the improbable title, how about that cover on the left?! It's hard to really take it in, isn't it? Just that awesome. I mean, I dare you to look at it and not burst into the theme song from The Facts of Life. Or Family Ties. I used to own the cover on the right and then gave it away as a gift. When I found a replacement copy it came with the cover on the left and I still haven't been able to wipe the grin off my face. As for the title, I don't know what to say except you're simply going to have to overlook it. Patricia (Trish) Masters is your basic good girl. The oldest of two, blond and pretty, she's an honors student, plays on the tennis team, and is everybody's friend. Colin (Mac) McNamara is your basic screw up. The only child of a cop and a nervous stay-at-home-mom, dark and lean, he's flunking out of school, has the worst reputation of any kid in school, and is nobody's friend. But Colin likes watching girl's tennis. And one day he runs into Trish after school and, even though he makes her nervous, she finds herself wanting to get to know him better. Over the next several weeks they find reasons to run into each other again and again and both of them are surprised to find they're neither of them exactly what their reputations would have you believe. Trish is a lot less confident than she appears and she longs for someone to talk to about the changes coming into her life. Colin has a past, and even though it's not the one people attribute to him, he's its prisoner just the same. The question is can these two very different young kids overlook their differences and stick together long enough to help each other deal with their fears? Trish meandered through the Boston Public Library. She didn't like using the little memory-bank computers the library had instead of a card catalog, so she usually just wandered around, picking up books that looked interesting. For a minute, she watched a man reading a book upside down; then, realizing it was probably getting late, she walked toward the main staircase. Hurrying, she almost bumped into someone. "Excuse me--" She stopped and stared, recognizing Colin. As he saw her, he stiffened. "Uh, well." Trish frowned at her books. "The same thing you are, I guess." He ran his free hand through his hair, unmistakably rattled. "Sports," he said. "I like to read about sports." "I don't know. You know." He backed up toward the stone railing, dropping two of the books when he hit it sooner than he expected. "The Old Man and the Sea?" Trish asked, bending to pick one up. He got to it first. "Fishing." "How about Richard the Second?" She picked up the other one. She gave it to him. "What are you, a brain?" "I gotta go, I'm late." He turned, walking swiftly down the stairs. Trish watched him go, confused. "Hey!" He was suddenly back. "Hey, woman!" She looked at him uncertainly. "It's getting dark outside." His voice was accusing. "Oh?" She tilted her head, not sure what he meant. "You walk around in the dark every night?" "I only live a couple of blocks away." "So you walk around in the dark? You know how stupid that is?" "No," she said, grinning. "I'm not a brain." "Yeah, well, how long you gonna be in here?" "I don't know, I guess--"
"Well, I'll wait," he grumbled. "Don't feel like reading about you in The Globe tomorrow." "I said I was waiting already." "Um, I guess I can go now." Trish started down the stairs. He nodded, indicating that he'd be by the door. "You really don't have to do this," Trish said once they were outside. "I can walk by myself; I do it all the time." "Terrific, you do it all the time." He shook his head. And, in the end, it's a love story. And an incredibly genuine and endearing one at that. 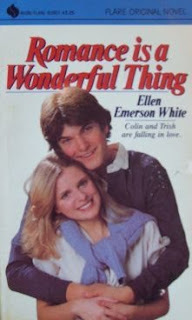 Colin and Trish are easy to like and they certainly stand out as being two of the least acerbic of White's protagonists. It's impossible not to fall for Colin, with his smart mouth and terminal self-deprecation. He hides his true self exceedingly well, only letting his guard down when he's at home talking to his cat Ophelia. Or, increasingly more often, when he's with Trish. I know this is another out of print book I'm recommending, but used copies are available very inexpensively. And if, like me, you're in the mood for a cozy, utterly disarming read during this dreary season, Romance is a Wonderful Thing is just the thing. Darn it. *adds to wishlist*. So, um, what's it about? Diana, *grin* was I too vague? OMG. I so remember this - I have the one with the cover on the right, I bet it's still somewhere in my parents' house! I inherited it from my elder sister, IIRC, and then read and re-read it obsessively. And I loved loved loved the scene you quoted. Thanks for the blast from the past! I may have to get another copy. If only so many amazing books weren't out of print...or were easy to find like John Grisham books or something. sigh. What a great scene you've quoted! I really want to read this book now, but I probably wouldn't have considered it if I'd seen it somewhere with that title and the cover on the left. What would we do baby, Without Us? Ha! I love that cover on the right - I hadn't even heard of this one while trolling for other EEW books. Very sweet and Valentines appropriate. Li, whoa, you read it!?! And multiple times even? That is so awesome. Definitely trademark EEW in there. I'm so happy someone else has read it and loved it. Michelle, I know. To have one such awesome cover is one thing. To have two boggles the mind! or should I say I love Colin? He's like an earlier version of Derek (life without friends). I found this on the shelves when I was working the kids & teen section of a large indie bookstore in the early 90s. Fell. In. Love. I still have it (right hand cover) and read it every couple of years, because the dialog is spot-on, the emotional arc perfect for a high school romance, and the characters very true to life. This post is a super Valentine's present! Melissa, her dialog just blows me away in every single one of her books. And this one is so dang sweet. Have you read most of her other stuff? Angie--I'm glad that I recommended the title to you. I don't think I've ever been able to decide which is my favorite EEW book between this, Life Without Friends, the last two President's Daughter titles, and the Road Home. That doesn't leave much out, does it? I just looked at my copy, and I have to admit that this one has the most wear (spine creases and such). That says something. I bought a copy with the cover on the right from Young & Welshans Books in Flint in the early 90s. It cost a whopping $2.95--which just seems phenomenally low now. I wish they'd reprint it already. Angie, I read this when it first came out. I meant to tell you sooner. I absolutely remember the cover on the left. Remembered wishing the woman looked younger and the boy was cuter because I loved the book but had this weird image of the couple in my head. Again, you make me wish I'd never donated most of my YA books to the library when I turned 20!